For some reason, you don’t hear people raving about Poland as a culinary destination in the same vein as Italy or France. After just a weekend in Kraków, I’m left wondering why. Maybe the quarter or so of me that’s Polish is enough to genetically program me to never want to eat anything other than pierogi and śledzie for every meal for the rest of my life. But considering my friends of Italian and Greek descent loved the Polish cuisine too, it must just be really good food. Pierogi ruskie with kompot to drink at Chopin. On our first day, the first thing we did after dropping our bags at our hostel was search for a lunch spot. We landed at Chopin, right on Rynek Główny. Considering the sleep-deprived, zombie-esque state we were in at that point, I’m shocked that we happened to wander into someplace so good. The interior is tasteful and the service was extremely friendly (our waiter helped us properly pronounce the Polish word for “thank you,” “dziękuję”), and the prices were very fair. Of course, the food was great as well. I had pierogi ruskie (pierogi with potato and cheese filling, topped with fried onions), kompot (a drink made of stewed fruit juices), and sernik (Polish cheesecake), and I’d highly recommend all of the above. 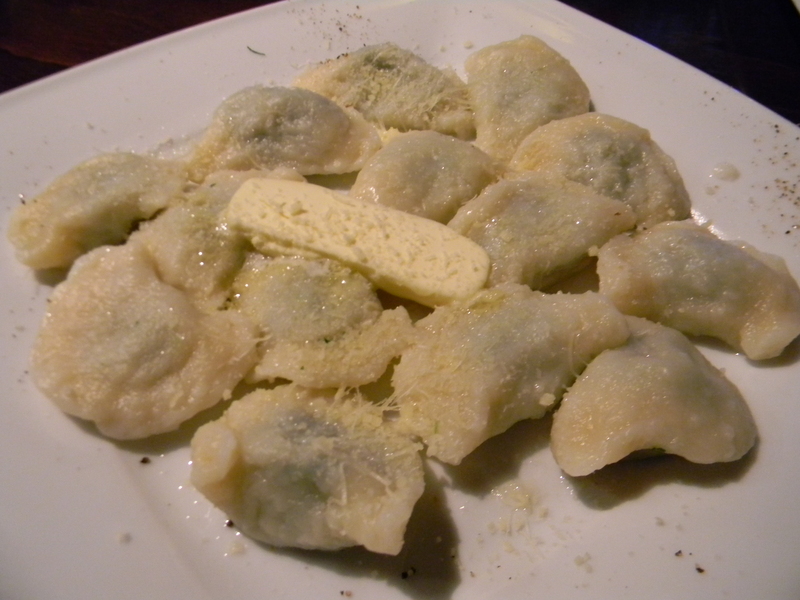 Pierogi ze szpinakiem at Studnia Życzeń. On our second day, we made our way into Kazimierz in search of food after a long afternoon wandering Wawel Hill. Somehow, we ended up at an Italian restaurant, Studnia Życeń. Luckily, they still had plenty of traditional Polish food, like the pierogi ze szpinakiem (pierogi with spinach and parmesan) and grzaniek galicyjski (Galician mulled wine) that I ordered. 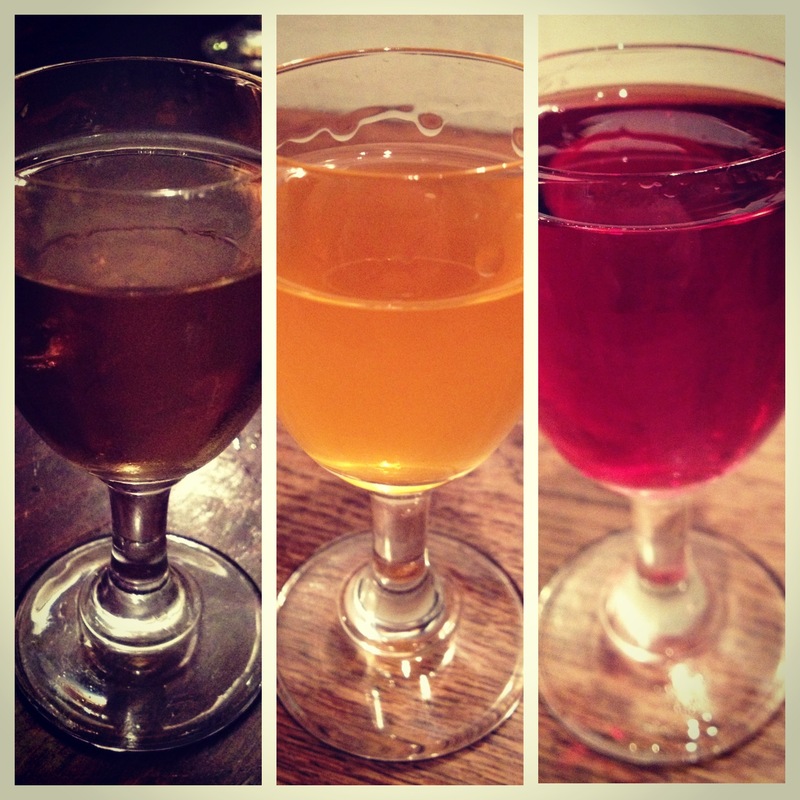 With my great-great-grandparents being from Galicia, I had to check out at least one Galician dish, and their take on mulled wine was delicious – if you’re in Poland during the chilly months like we were, grzaniek galicyjski is a great way to warm up. And of course, the pierogi was great, too. 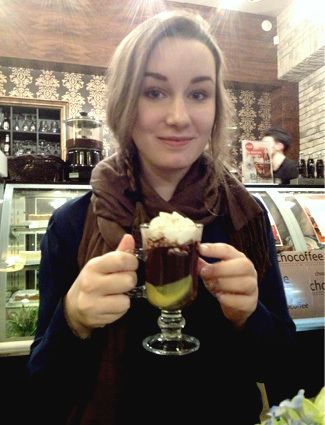 Far too pleased with myself about ordering this hot chocolat with advocaat at Chocoffee. After walking off dinner on the second day, we were looking for a cupcake shop near our hostel for dessert, but instead stumbled upon Chocoffee. That was a very, very lucky mistake. We ended up ordering a round of hot chocolates, a chocolate fondue plate, and a piece of caramel cake. The hot chocolate was some of the thickest and chocolatiest I’ve ever had (though it still didn’t quite manage to top L.A. Burdick’s milk hot chocolate as my absolute all-time favorite) – luxuriant is the best adjective I can think of to describe its taste and texture. The kind I tried was mixed with advocaat, an egg liqueur. It sort of harkened back to Christmastime and eggnog. And the caramel cake I ordered was excellent as well – not too sweet, and with a perfect texture. I think Chocoffee has a handful of locations throughout Poland, so be sure to look for it if you’re heading to one of the major cities. Śledzie w smietanie at Ambasada. After an afternoon nap on our second day, one of my friends and I decided to head out. Our first stop, per a friend’s recommendation, was Ambasada, a pub that derives its name from its location across the street from the American Embassy (as a ‘Murrican, I enjoyed this). My friend ordered kielbasa, which she’d been searching for since we’d arrived, and assures me it was excellent. 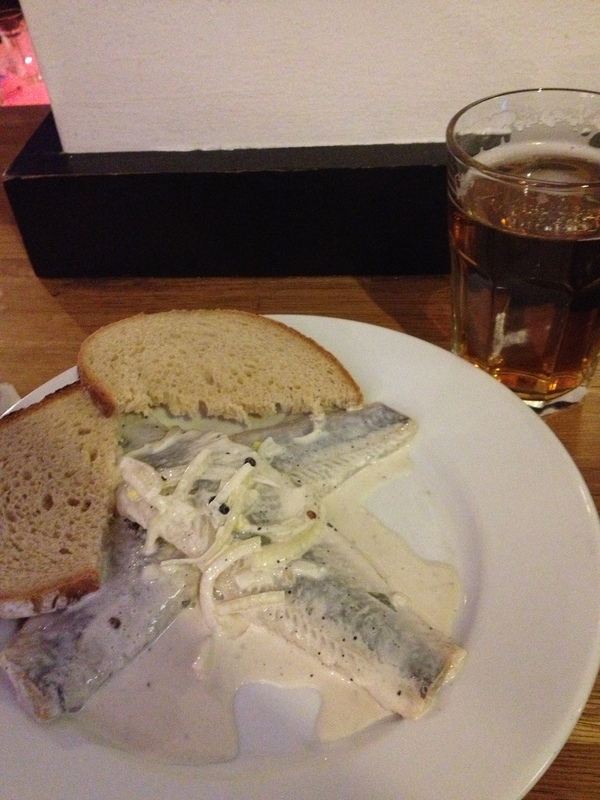 My śledzie w smietanie (pickled herring in sour cream) was beyond delicious. You have to really like fish to enjoy it, because the fishy taste is really strong, but I absolutely loved it, especially when washed down with a glass of Polish beer (or, as they’d say, piwo). Hazelnut, mango, and raspberry vodka at Wódka Cafe Bar. The second (and last) stop of the night was Wódka Cafe Bar, where we’d also stopped briefly on our first night on the recommendation of some other travelers. It’s definitely a place to put on your itinerary. The bar boasts over 100 different kinds of vodka, so you can try pretty much anything you can think of. The bartender’s go-to recommendation seems to be a shot of hazelnut vodka, which is good but quite strong. Personally, my favorite was mango, with raspberry a close second. I’d also definitely recommend ordering tatanka, which is made with apple juice and Żubrówka (bison grass) vodka – fun fact: real Żubrówka is banned in the United States. In addition to an extensive selection and good service, pricing was fair, with shots around 9 zloty (£1.90) and a glass of tatanka costing 11 zloty (£2.30). Whatever you get, I’d recommend sipping it – primarily because it tastes too good to down it like a shot of whatever awful liquor you find at college parties, but also because this stuff would definitely mess you up if you didn’t slow down. 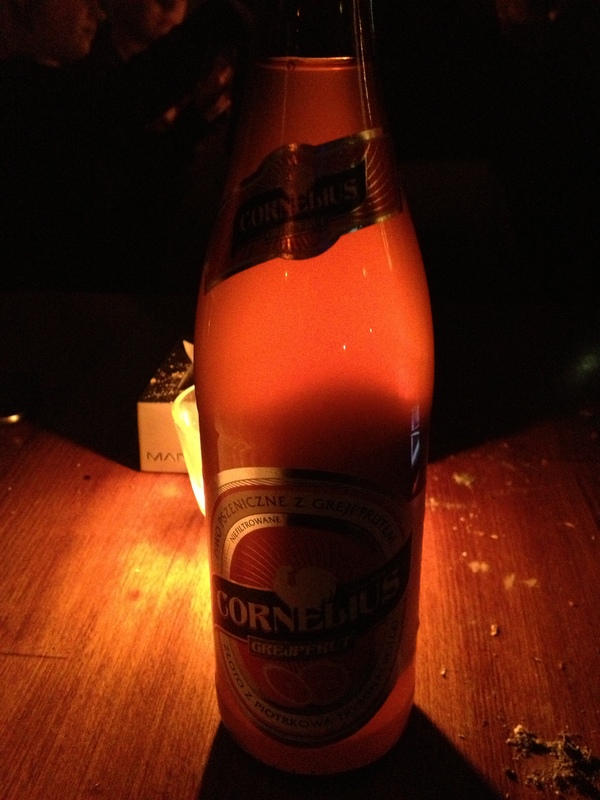 Cornelius Grejpfrut beer at AntyCafe. I’ve also got to mention AntyCafe, the bar/coffee shop that sent us on a wild goose chase on our first night in Kraków. We’d been told it’s a really cool place where locals like to hang out, and we quickly figured out why it’s not full of tourists: there’s no sign outside to identify it! Luckily, with the help of Google and the free WiFi that’s everywhere in Poland, we managed to find it, and it was worth the work, if only because the bartender pointed me toward Cornelius Grejpfrut beer. I’d never even heard of grapefruit beer, so of course I had to give it a try, and I loved it. Plus, the pricing was good, with a pint only costing 9 zloty. It was so hard to leave Kraków knowing we’d barely scratched the surface of the restaurant and bar scene in town. 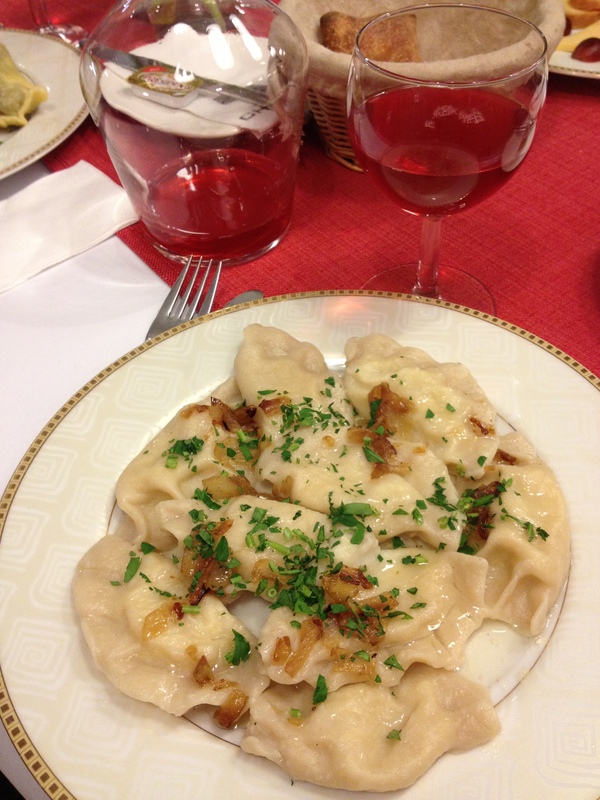 I already miss the pierogi – and the pretzels you can get for just 1.50 zloty on every street corner. Sigh. This work by Rachel Clark is licensed under a Creative Commons Attribution-NonCommercial-NoDerivatives 4.0 International License.